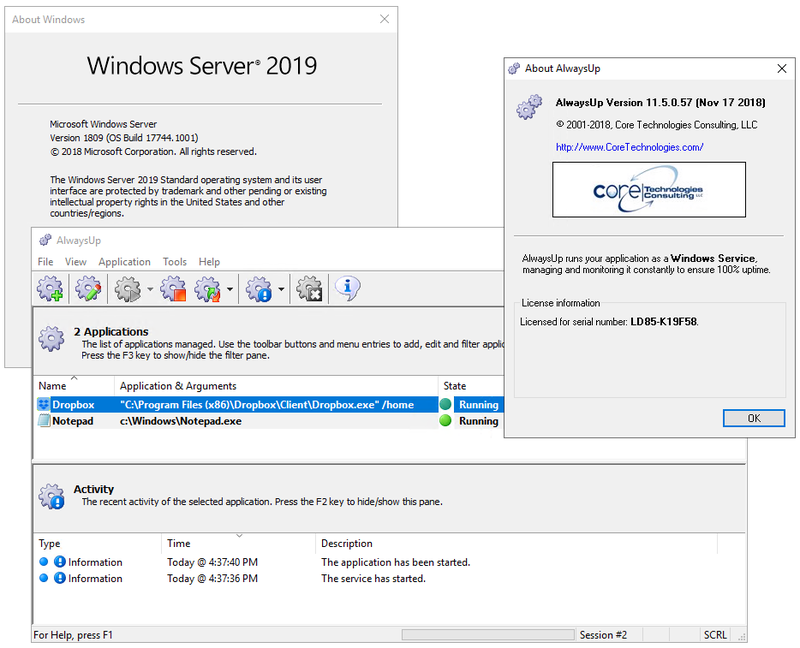 Earlier this month, we presented a couple of options for periodically restarting a temperamental legacy application with AlwaysUp. 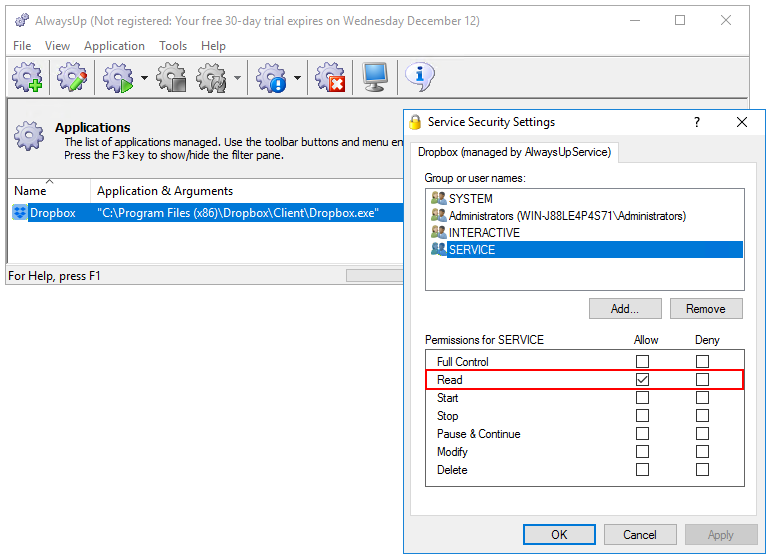 You can either restart once per day (via a setting on the AlwaysUp Monitor tab) or multiple times per day (using the Windows Task Scheduler). Well, today we can offer you a third option — one that doesn’t rely on additional software, like the Task Scheduler. By leveraging the powerful Sanity Check feature — which allows you to plug in your own failure detection system — we can get AlwaysUp to close and restart your program every few hours. 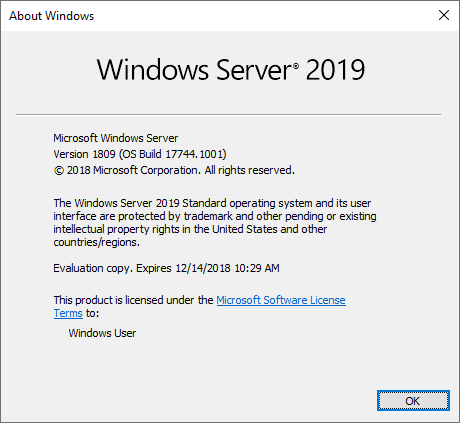 For this example, we’ll work with Microsoft OneDrive — already installed as a Windows Service on our Windows 10 machine. Save the file in your AlwaysUp installation folder, C:\Program Files (x86)\AlwaysUp. We have named our batch file “SignalRestartSanityCheck.bat”. Select Application > Edit/View to open OneDrive in AlwaysUp. In the window that comes up, enter the full path to the batch file you created in the Run field. Confirm and save all your changes. After 4 hours have passed, AlwaysUp runs the batch file (sanity check). The batch file exits with 1, signaling to AlwaysUp that OneDrive should be stopped. AlwaysUp restarts OneDrive (as specified on the Restart tab). What is the Spooler service? What happens if I stop the Spooler service? Is it safe to disable the Spooler service? What should I do if the Spooler service isn’t working? I made a mistake. How do I cancel all printing? Canceling didn’t work. Is there another way to clear out all pending documents? The Spooler service is stuck in the “Stopping” state — Help! The Spooler service keeps stopping for no reason. How do I keep it running? 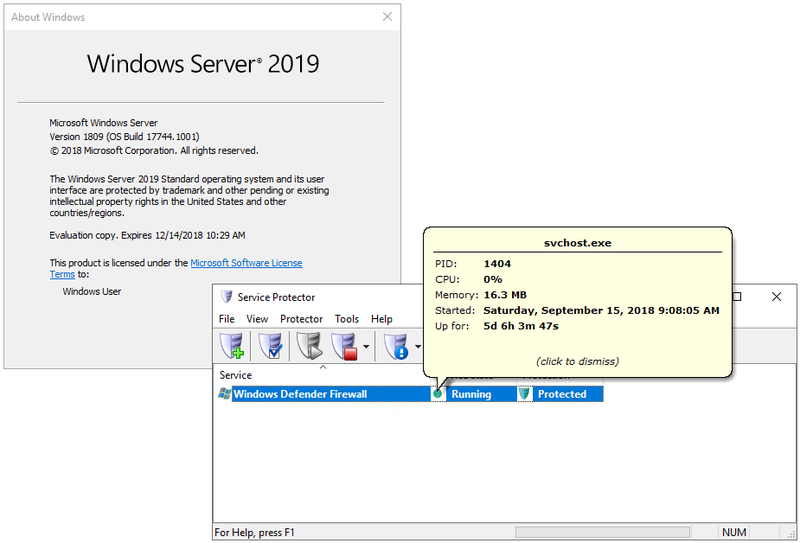 The Windows Print Spooler is a key operating system component that manages all printing on your computer. It is started when your PC boots and runs unattended, 24×7 as a Windows Service. The Spooler does not show any windows or tray icons. It is an invisible technical component that presents an Application Programming Interface (API) to programs looking to manage printing. The Spooler is always listening for print requests. It accepts documents from any application running on your computer. The process of handing off a document to the Spooler is called Spooling. Once an application is done spooling a document, the Spooler is responsible for the actual printing. The application can go back to its normal tasks. After the window has disappeared (i.e. Excel is done spooling), you will be free to edit your spreadsheet while the actual printing proceeds simultaneously. You can even close Excel! None of that matters to the Spooler, which will ensure that your spreadsheet makes it to the printer — independent of Excel. Ever printed several, lengthy documents at the same time? The Spooler makes that possible — without overwhelming your printers. Adds a new item (a print job) to the print queue. Sends the print job to the printer (when the printer is ready). Monitors the printer as it produces pages. Removes the job from the queue once the printer has produced all pages. Open the Control Panel (available from the Start menu). From there, you can cancel all print jobs (“clear the queue”), pause a specific job or stop printing altogether. The Spooler’s mission is to make sure that all your documents are printed — even if there is a brief outage or interruption. For example, if your printer temporarily disappears from the network, the Spooler will wait a reasonable time for the device to come back before declaring a failure. And if your request to print a single page is stuck behind a 200-page behemoth, the Spooler will ensure that your document gets its turn, eventually. If you don’t have any physical printers attached to your computer and you and never plan to do any printing, you can safely disable the Spooler service. However, watch out for applications that silently use the printing API. They will also fail when the service is disabled. Be sure to run those commands from an elevated command prompt, otherwise they will fail with permissions errors. To clear all printing, open the printer queue (see above) and select Cancel All Documents from the Printer menu:. Give the Spooler (and your printer) a few seconds to respond to the request. 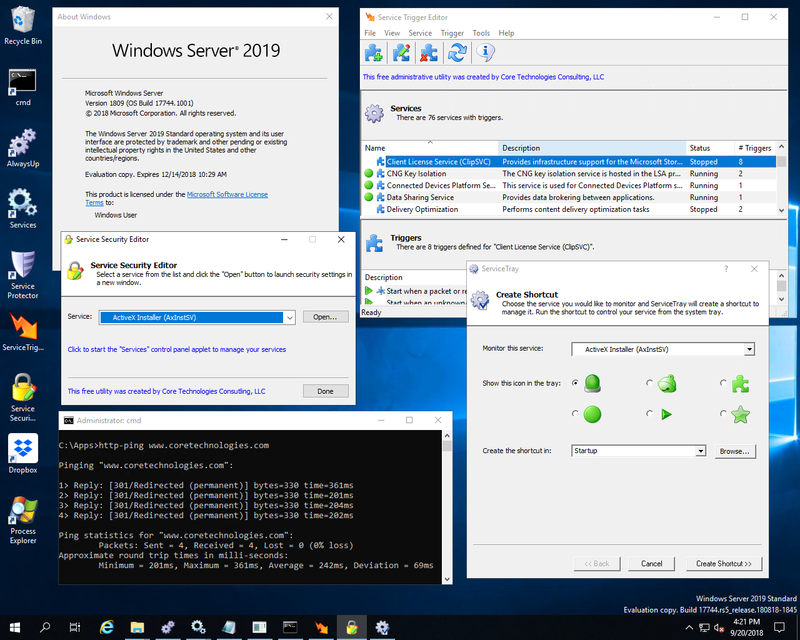 As reported in Microsoft’s technical forum, the problem may be with “desktop interaction” — an obscure windows service setting. Afterwards, you should be able to start the service. The service should transition to the stopped state. Our Service Protector utility may be able to help. Please follow this step-by-step tutorial showing how to protect the Spooler service. If you would like to know more about the Windows Print Spooler service, or you have a specific problem, please feel free to get in touch. We will do our best to help you! We are currently using AlwaysUp with several executable instances. We need to have these restarted daily due to memory leaks from the application. I don’t see a scheduling restart option in AlwaysUp. 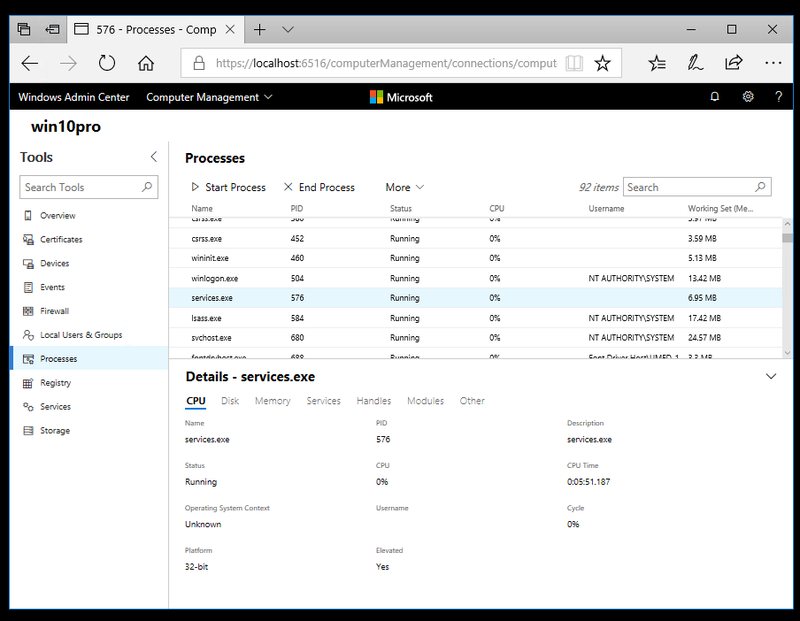 I think this could be done through a windows task but I see that these are being run as windows services. 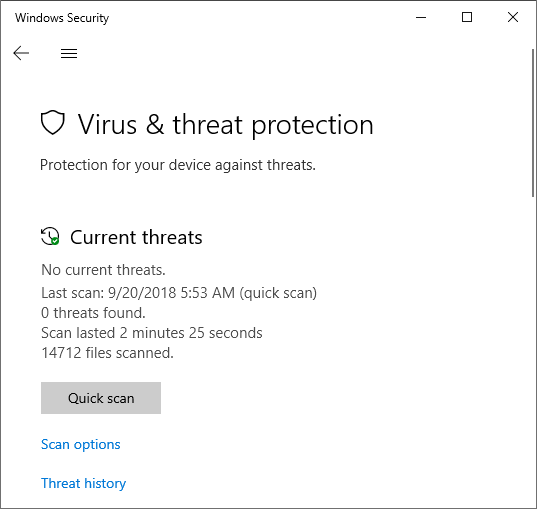 Would you recommend doing this as a windows task or would the Service Protector be a better option? Hi Kevan. Sorry to hear of the awful memory leaks! AlwaysUp makes it very easy to restart your application once per day, at a time of your choosing. Edit your application in AlwaysUp and look for the Every setting on the Monitor tab. Note that AlwaysUp can restart conditionally — only when one or more conditions are met. For example, to avoid restarting when the software is busy, check the It has been idle for at least box and fill in an appropriate duration. And if you find that simply restarting the application doesn’t clear the problem, you can try rebooting the entire machine. That option is available at the bottom of the form. If restarting once per day is not enough, you have my sympathies! First, please create a batch file that restarts your AlwaysUp service. It will contain two lines — one to stop the service and another to start it. NET STOP "Dropbox (Managed by AlwaysUpService)"
NET START "Dropbox (Managed by AlwaysUpService)"
The ” (Managed by AlwaysUpService)” portion is a necessary part of the service’s name. All services created by AlwaysUp feature that suffix. Note: The batch file may not work as expected if it takes your application longer than 30 seconds to shut down. This is because NET STOP will only wait for 30 seconds before giving up. And if it does give up, the subsequent call to NET START will fail too. 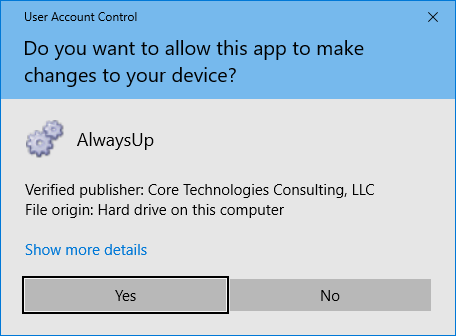 So after running the batch file, the AlwaysUp service may end up in the “Stopped” state — not what you want for your 24/7 application! 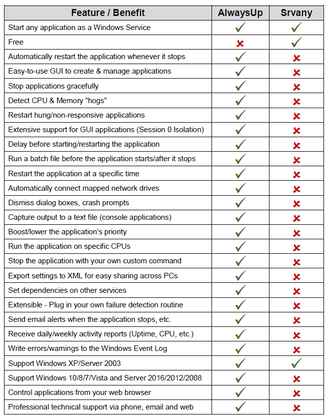 For slow applications, we recommend using our free ServicePilot utility instead of NET. ServicePilot can be configured to wait much longer than 30 seconds for the service to stop. 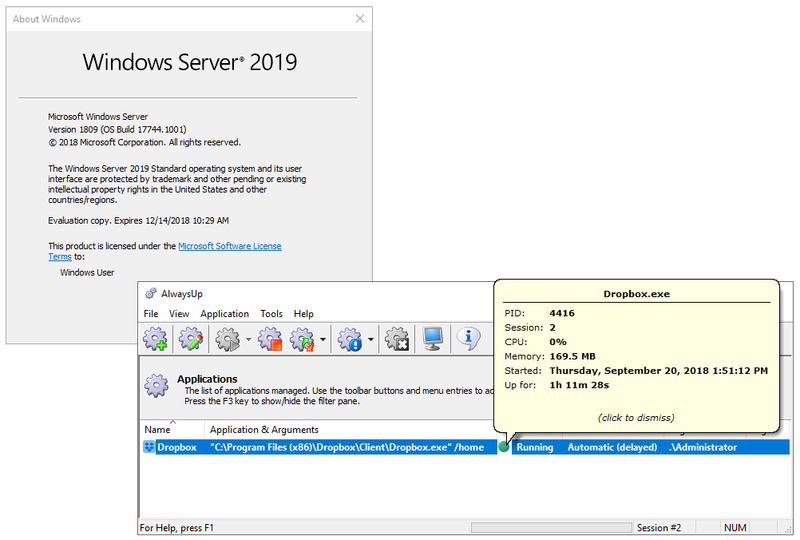 "C:\Program Files (x86)\AlwaysUp\ServicePilot.exe" -restart -wait 300 "Dropbox (Managed by AlwaysUpService)"
That command will wait for up to 300 seconds (5 minutes) for the service to restart. Give the batch file a meaningful name and save it to your AlwaysUp folder (C:\Program Files (x86)\AlwaysUp). We’ll need its full path in the next step. 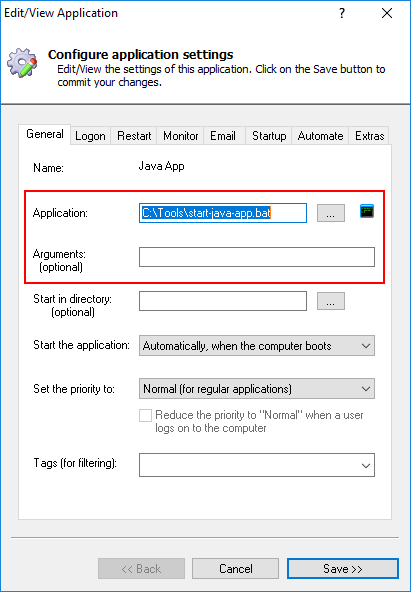 Here’s how to run the batch file (and restart your application) every day at noon. In the Create Basic Task Wizard window, enter a suitable name. You can leave the description blank. Here you specify the time to restart the service/application. We have selected today at noon but you should select whatever time works for you. Leave Recur every at 1 day and click Next when you are ready to proceed. The basic configuration is now complete and you will see a summary of the scheduled task to be created. And on this final screen, select the Run whether user is logged in or not option and check the Run with highest privileges box. These are required by Windows to manipulate the service on your behalf. With this new task in place, Windows will automatically restart the AlwaysUp service every day at noon. Want to restart again at 2 PM? Simply repeat the process to create another task but select 2 PM instead of noon. Advanced users can save a few clicks by exporting the task to a XML file, updating the file to specify a different time, and importing the modified XML to create a new task. Why should I Pay for AlwaysUp when Free Alternatives are Available? Sure, not everyone looking to run a program as a service needs AlwaysUp. 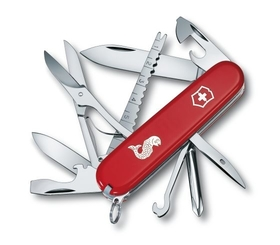 A free tool can be a fine choice, especially for hobbyists and home users. 1. Where will you go for help if you have questions (or things go wrong)? 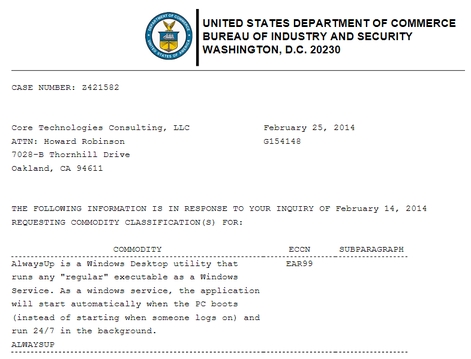 The wonderful world of Windows Services can be tricky to navigate. Technical obstacles (like Session 0 Isolation) abound. As a professional, you owe it to your business to plan for all eventualities. Is there a phone number to call when you or your team needs urgent help? 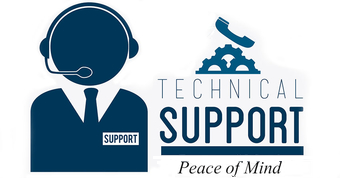 How about a support email with a 24-48 hour response time? Can you easily find online FAQ’s and other helpful resources? At minimum, please make sure you have a contact! 2. How much of your own time will you have to spend on the “free” solution? The cost of an item is usually more than its initial, sticker price. 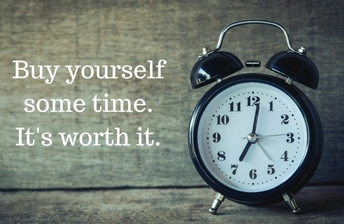 We often underestimate true, long-term cost because we forget to add our time to the equation. For example, say you want to buy a new computer desk. Which is cheaper? It’s a no-brainer, right? #2 is the way to go. But what if it’s going to take you a couple of hours to unbox and assemble the Ikea furniture? Does option #1 (which avoids that extra labor) seem the more cost effective choice now? Similarly, a free alternative to AlwaysUp definitely saves a few bucks at first. But once you have the free software, how much of your valuable time must you devote to installation, troubleshooting and support? Might those ongoing costs dominate the equation? We realize that your time is important. And we designed AlwaysUp to save you time — initially and over the many months and years you will use the product. We’ve authored over 110 step-by-step tutorials, to get you up and running in minutes. We created the AlwaysUp online troubleshooter, to help you quickly and efficiently diagnose and cure common problems. 3. Are you willing to take on the additional risk? When you use unsupported software in your business, you become responsible for it when it fails. The buck stops with you. Are you willing to assume that risk? To accept blame from your boss/team if the software misbehaves or becomes unusable after a Windows update? Realize that your reputation (and perhaps your job) may be at stake, especially if you are operating a mission-critical system! 4. Are you sure you won’t need AlwaysUp’s extra features? With over a decade of real-world use, AlwaysUp has evolved to include a ton of features — many of which are not found in free alternatives. Send you a weekly report showing how your application is performing. As many customers have discovered, these extra features can come in very handy down the road! 5. How important is security? Needless to say, you should be very careful when introducing new software into your secure environment. Can you say the same for the free software?